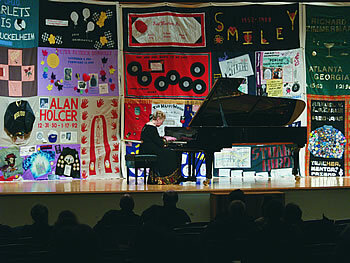 Four sections of the AIDS Memorial Quilt draped the stage of Warner Concert Hall in February during a guest recital by pianist Barbara Nissman. The two-day quilt viewing was one of several campus events highlighting HIV/AIDS awareness, including a lecture by Oberlin Trustee Robert Frascino ’74 and Steve Natterstad, physicians specializing in HIV/AIDS. Lending support to the project was The Robert James Frascino AIDS Foundation.